On a rainy midwinter day, Taro Yamamoto stood with a small group of people in front of Shimokitazawa Station in Tokyo’s Setagaya Ward and addressed passers-by in that artsy youth-culture hub. 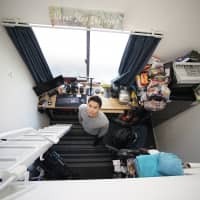 The 37-year-old went on to explain that the campaign aims to get the signatures of 214,236 of Tokyo’s eligible voters (one 50th of the total). 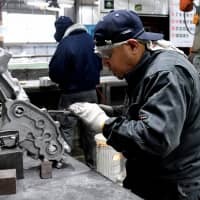 Members of the Tokyo Metropolitan Government Assembly would then be legally bound to vote on whether to hold a referendum among the citizens within its jurisdiction, asking if Tokyo Electric Power Co. — operator of the crippled Fukushima No. 1 nuclear power plant — should be allowed to run such facilities or not. 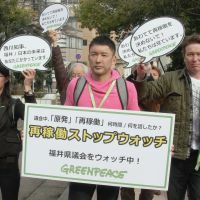 Yamamoto was the first actor to speak out and call for Japan to totally renounce the use of nuclear power following the explosions and triple reactor meltdowns at the Fukushima plant in the wake of the Great East Japan Earthquake that struck the northeastern Tohoku region on March 11, 2011. Previously, it had been taboo for anyone in the entertainment world here — and in most of the media, for that matter — to say anything negative about nuclear power in this country. That was (and still is to degrees) because advertising and sponsorship paid for by power utilities and connected interests comprises a significant proportion of those sectors’ revenues. 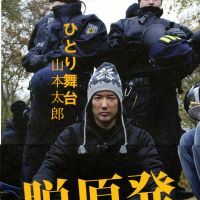 Nonetheless, on April 9, 2011, Yamamoto declared his opposition to nuclear power on Twitter, and the following day he joined the front rank of a 15,000-strong antinuke demonstration in Tokyo. As he tells it in his recent book “Hitori Butai” (“One-Man-Play”), just a month later an offer for him to appear in a TV drama series was withdrawn because of his actions. Yamamoto then quit the entertainment agency to which he belonged and became a freelance actor. 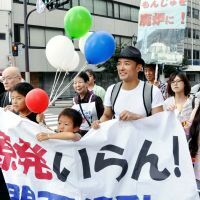 Since then, he has been participating in protests across Japan calling for the authorities to cease the operation of nuclear power plants. His views have attracted considerable attention, and as of now he has almost 170,000 followers on Twitter. 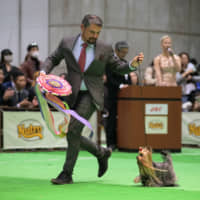 Born in Takarazuka, Hyogo Prefecture, Yamamoto and his two older sisters were brought up by their mother, who sold Persian carpets, after their father died when he was an infant. In 1990, when he was 16, Yamamoto made his TV debut in a students dance-contest program called “Dance Koshien,” where the popularity of his performance ensured he was invited back many times. Then, after he dropped out of high school, he landed his first movie role in 1991’s “Daida Kyoshi” (“Pinch-hitter Teacher”). From 1996 to 2002, he worked as a reporter for a TV documentary series called “Sekai Ururun Taizaiki” (“World Stay Report”). 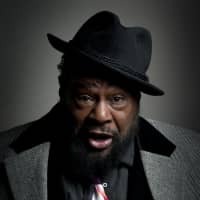 During that period, he also played a leading role in “Battle Royale,” a movie made in 2000 by the renowned director Kinji Fukasaku, and acted in many other films and TV dramas. In 2003, Yamamoto won the prestigious Blue Ribbon Supporting Actor Award. Despite his busy campaigning schedule, Yamamoto was happy to talk at length with The Japan Times a couple of days after that appearance he made in the rain outside Shimokitazawa Station on Jan. 24. May I start by asking you to tell me about your childhood? I always had loads of energy. When I was in elementary school; for instance, I’d hop on a Takarazuka City garbage truck that did lots of pick-ups and then went to my school’s kitchen to collect the waste. So I’d join it near my house and help the workmen and ride on the back until we reached my school. I used that truck as my school bus. Did the school not call your mother to complain? Yes they did — but my mum got many calls about my behavior. How was your time in junior high school? Well, I would always point out illogical comments made by the teachers, so I was not a good student in their eyes. For example, school rules banned the use of hair mousse, but teenagers want to use that kind of stuff. Boys who wore their hair a bit long used soft mousse so the teachers didn’t notice — but when I used it on my short hair, I stood out. I thought the other students would fight to be able to use hair dressing. However, they chose to go home. As a result, I had to wash my hair. How were your high school days? In junior high school, one grade had only two classes and so there weren’t many classmates to choose from. I found it hard to have friends who supported me. But in high school, one grade had 11 or 12 classes, so I enjoyed having a wider circle of friends. Around that time, I also had an opportunity to appear on television. Was that in “Dance Koshien”? Yes. The weekly program went out on Sunday. One week when I happened not to see it, a performer on the show was the talk of the class the following Monday. Everyone was excited by that dancer, who was also a high school student. The following Sunday I watched the program and that student appeared again, but I couldn’t understand why my friends were so excited about her performance. That made me a bit upset, because I had great confidence in my own ability. Did you think that dancer was not as good as you? Yes — but that made me realize my friends didn’t recognize my talent. I was angry about that, too, and that anger drove me to apply to do an audition for the dance contest. I watched you dancing in that contest on YouTube. You wore swimming trunks. Why? At the first audition, I wore a school jersey and a leotard for a middle-aged woman. Then at the second audition, I thought it would be better to be more simple. Actually, though, it wasn’t swimming trunks I was wearing; it was my underwear (laughs). Because my mother had always said that I should graduate from high school, when the principal gave me that ultimatum, I seriously started wondering which option I should take. I was so surprised and moved to tears, because her words were the opposite of what I had imagined. I think your mother was incredible. Well, I think there must have been a gap between my image of my mother and her true self. I probably misunderstood her ideas on parenting before that. My mother had brought me up pretty strictly. She thought she should discipline her children so they would be able to cope if she died. If she died suddenly, we would become foster children, and so she tried to raise us to be good so we wouldn’t bother our foster families and would be properly cared for by them. I was strongly influenced by her, and whenever I received any money, such as an otoshidama (New Year’s gift of money), my mother would collect a percentage of it. It sounds as if she was taxing you. That’s exactly what she was doing. The money was donated to UNICEF, the Red Cross or some other social-welfare organization. After your mother told you that you had to make your own decision on the course of your life from that point, what did you do? Well, I didn’t think I could continue dancing in underwear for the rest of my life. I needed to look for other things to do as a job — for example, singing or acting or whatever. I chose to be an actor because I realized that actors usually get scripts in advance and have time to learn their lines and how to deliver them. It was just a very rough image I had, though. When you embarked on your acting career were you successful from the start? Until my mid-20s, I didn’t have many job offers. I was in the movie “Battle Royale,” which was directed by Kinji Fukasaku. After that, I felt that many people trusted me, and I kept getting job offers. But before I worked with Mr. Fukasaku, I’d worked with the director Kazuyuki Izutsu on his made-for-TV film “Totsuzen Honoo no Gotoku” (“Suddenly Like Flame”), which was shown on the Wowow channel in 1994 — and it was him who really introduced me to the joy and challenge of being an actor. He would refuse to sign off on a scene until he was perfectly satisfied with it — no matter how many takes he would tell me to do. That experience made me realize I had not really reached the passing grade to call myself an actor — but it also taught me how the work of an actor is like that of a high-level craftsman. In the movie “My Way” by South Korean director Kang Je Gyu, which is showing now around Japan, you play the role of an Imperial Army soldier named Noda, a sergeant who bullies Korean soldiers in his unit. How do you regard your role? 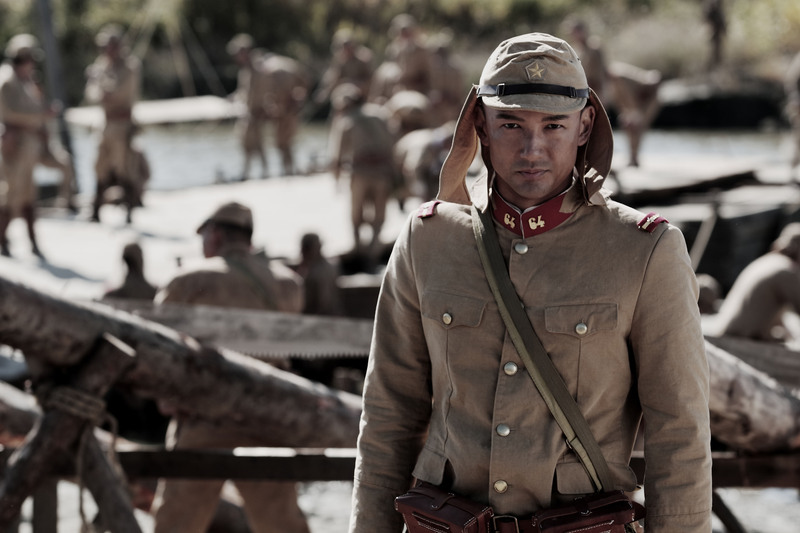 At the audition, I was asked to play two roles: a simple Japanese soldier and a disgusting one. I wanted to get the role of the simple one. But to show my range of acting technique, I played him by acting super-simply, and that of the disgusting soldier by acting like he was crazed. Then they offered me the role of the nutcase, and I must say that at first I hesitated to take it. Many years ago, I auditioned for a movie that was set in Nanjing. It was about Japanese soldiers who kept on killing Chinese civilians, and the Japanese were equated to brutes who acted inhumanely. So that was why I didn’t want to appear as an icon of Japanese evil in the South Korean movie. I hoped the film would show a bit of the personal background of Sgt. Noda to explain why his personality was twisted. I negotiated with the director, Kang, about inserting something along those lines, but as we were talking I came to realize that he wasn’t a person who thought in narrow categories such as Japanese, Korean, German or Soviet, because he didn’t think those categories were important. Kang’s idea is that all sorts of people from everywhere each have different feelings and ways of living. That made me want to play the role, but I thought a lot about it and decided Noda wasn’t simply crazed, but he just desperately wanted to survive. 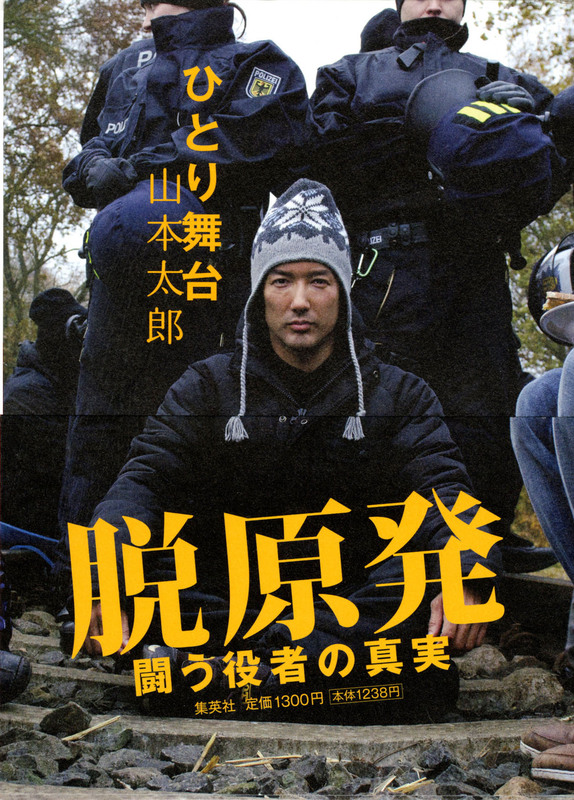 In the final scene, when he is mortally wounded, I asked the director to let the character say, “Mom!” By doing that, I wanted audiences to realize that Noda wanted to survive because he desperately wanted to go home and see his mother. Switching now to your anti-nuclear power activities, can I ask if you had any concerns about the issue before March 11, 2011? Not really; my main concern was my life. But ever since I was small, my mother supported children in the Philippines, and we went to see them when I was a kid. I was also influenced by her “New Year’s tax” of any cash presents I got, and for a long time I have contributed to help support the activities of organizations working in the field of welfare. So, when I received a lump-sum payment I would donate some to Medecins Sans Frontieres — and I have constantly supported Greenpeace for the last eight years. As regards nuclear plants, I didn’t understand how dangerous they are, but I knew that nuclear waste has to be kept for 100,000 years. So, when the earthquake and tsunami occurred on March 11 last year, the thought of any problems with nuclear power plants didn’t enter my head. Later, though, the media was telling everyone that “cooling the reactors is getting more difficult” — and I realized that the Fukushima nuclear plant was really dangerous. Faced with that, I just thought “I want to live!” So I questioned myself, asking: “To survive, what shall I do? I realized that the plant was — as it still is — in a dangerous condition, and that even though we are in a very active earthquake zone, Japan has more than 50 nuclear reactors along its coasts. It was obvious that a disaster could happen again at any time, so I wanted to make my concerns known. However, I thought that I couldn’t do that because we, as actors, can make good money appearing in commercial TV shows — and it is an absolute nonstarter to criticize the sponsors. How long did you spend wondering about whether you should speak out? I continued to think about it for about three weeks. But I thought it would be like ignoring the elephant in the room if I kept silent. I mean, wouldn’t it have been insane to continue the same way of living and ignore the crisis before my eyes? For instance, I have a dream to become a great actor, and to fulfil my ambition I must live longer. At that time, I was thinking I wanted to continue my job as an actor, though I realized offers might gradually start to dry up. But any worries about my career disappeared when the government raised the limit of radiation exposure for children to 20 millisieverts. Before that the limit was 1 millisievert — in line with the international standard. The effect of radiation on children is as much as three to 10 times more than it is on adults. Is it true that a job offer you’d had for a part in a TV drama scheduled to be screened in July was withdrawn? Yes. However, I have wondered whether I should speak about that. The situation of the (Fukushima No. 1) nuclear plant is critical and Japan is doing strange things, which is clear to the world. Yet why do actors here, whose job is to express themselves, stay silent? I wanted to inform everyone of the reason why I was being disadvantaged, but the focus went somewhere I hadn’t aimed at. Do you mean that the public was mainly interested in knowing which TV station had withdrawn its offer of a role? Right. But people couldn’t see the most important thing related to that issue — and it’s not accusing a TV station. That would certainly please the government and the electric power companies, because they could just stay in the background and let controversy swirl around the TV station. Why did you quit the agency you were signed to? The agency office was swamped for days with calls about my speaking out, and all its other operations were halted. But there are about 20 actors signed to that agency, and obviously those calls could affect their livelihoods. So I left. You said on Twitter that your income fell to one-tenth of what it had been before you spoke out. Actually, to less than a tenth (laughs). Do you have jobs in commercial broadcasting? It’s rough. I have job offers to speak on TV programs about nuclear issues, but I don’t have offers to act. 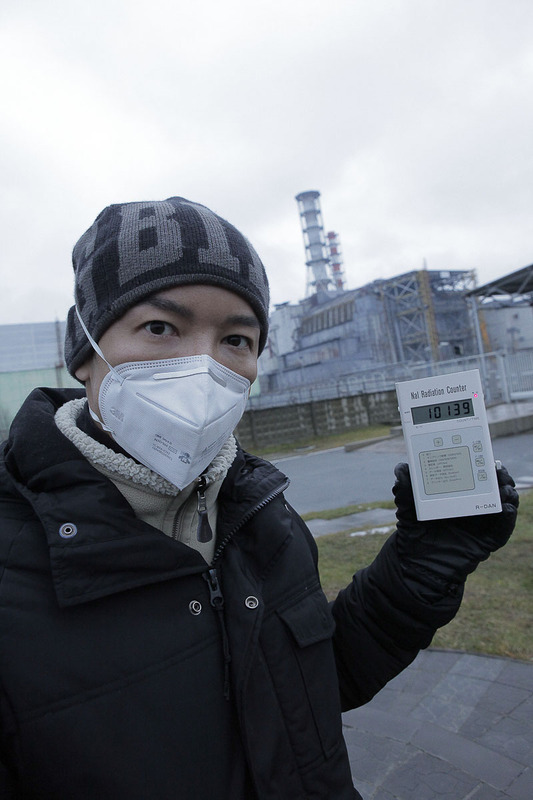 In light of this, what drives you to continue as an activist against nuclear power? I think that without life, nothing makes sense. We can’t see radiation, so it’s not being clearly recognized. How can we imagine the influence of what is not visible? I think the only way is to learn from those with experience — the people in Ukraine and Belarus who experienced the Chernobyl nuclear disaster of April 1986. So I went to Chernobyl. Like Japan, the evacuation area is 30 km around the nuclear plant. Even 25 years after the explosion, no one can live there. You went to Belarus, too. I heard that children there have suffered a lot from cancers. What did you see there? The places we visited had been selected for us by the authorities, so the information made available to us was limited. Belarus is an authoritarian state and the government is trying to promote nuclear power with financial assistance from Russia. It is absolutely taboo to speak about the radiation remaining in Belarus. When we visited several hospitals, the doctors couldn’t tell us the truth because if they did, they would be detained. The only opportunity I had to hear the truth was when I met some people through an organization working to help children in Belarus. They told me that not only cases of thyroid cancer and leukemia, but also diseases of the brain, heart, the digestive organs and other organs were all at very high levels. They also pointed out that even if a person had surgery for thyroid cancer, it didn’t mean the disease was cured — and they cited one child who was operated on at age 8 and then again at 15. Although I’d gone to Chernobyl in Ukraine to see the situation Japan will be in 25 years from now — and I saw a ghost town that probably looks like what the evacuation zone around Fukushima will be in 25 years — I was most shocked in Belarus. That was because everything to do with the planned new nuclear power plants is under wraps there; the media is controlled and citizens groups’ activities are restricted. In fact the situation there has disturbing echoes of ours in Japan. 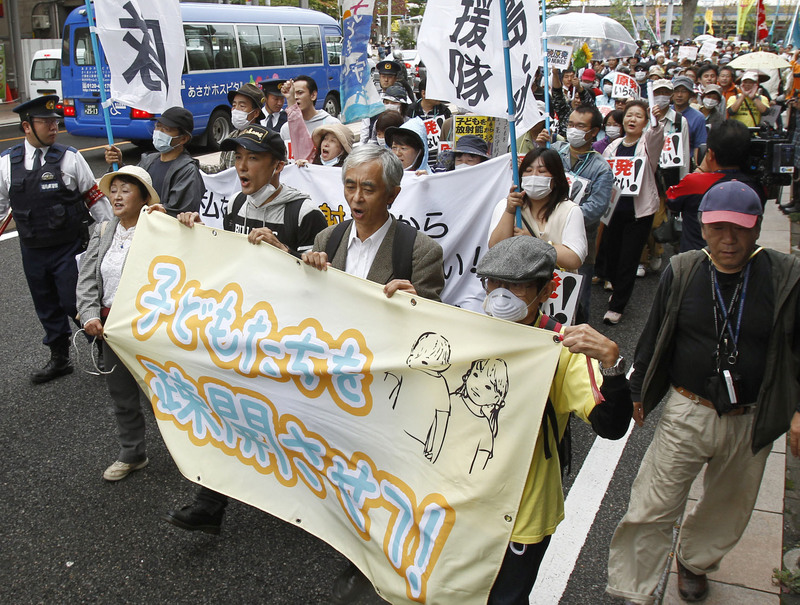 For example, Japanese police have arrested demonstrators attending rallies when the number of lines of people walking down the road increased from three to four. Also, when demonstrators pass in front of Tepco’s headquarters in Tokyo and purposely slow down outside, the police arrest them. I have not actually been arrested but I have been the subject of a legal complaint. That was in the city of Saga in July, when we (Yamamoto and a Saga residents’ group) took a petition calling for the prefecture’s idled nuclear reactors not to be restarted to the governor at the Prefectural Hall. Although the governor didn’t show up, someone should have accepted the petition on his behalf. But the officials said they would not accept it. That made the residents upset, and we tried to enter the Prefectural Hall to get an official to accept it. 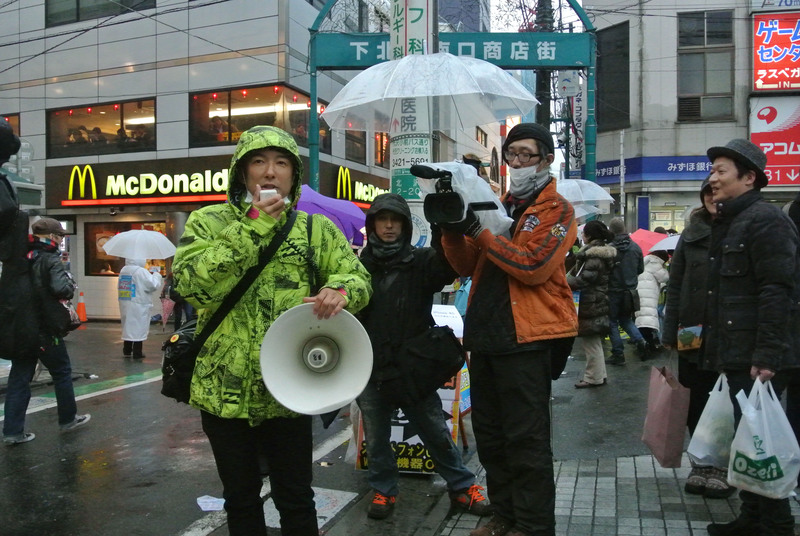 The scene was broadcast on TV and a man in Kyoto who saw it, called for me to be prosecuted. Sure, there are such strange people — but the serious problem was that the Saga District Public Prosecutors Office accepted the accusation and decided to see if they could put a case together against me. When you and the residents tried to enter the Prefectural Hall, did you do anything violent? No. We took great pains to be restrained and non-violent — yet in spite of that, I was accused. Although I was not prosecuted, which is natural enough because I did nothing, the accusation was reported and affected my job. The organizers of one event I was supposed to be paid to show up at canceled my appearance. I was also refused a “tie-up” with an airline. When actors and staff of a TV program go to shoot overseas, airlines will often not charge them on condition that the airline gets an onscreen plug. In the case I mentioned, out of all the actors and staff it was only my fare that the airline refused to pay. One of your activities is promoting a signature campaign aimed at getting Tokyo Metropolitan Government to hold a referendum on nuclear power plants. Would you explain more about that? To be honest, the possibility that Tokyo citizens will get to vote on this and show their opposition to or support for nuclear power may be low, because there are a lot of regulations surrounding plebiscites. To begin with, the person holding the petition forms that people sign must be an approved solicitor. However, an approved solicitor can only collect signatures in the ward in which they themselves live. Consequently, it is very difficult to collect signatures. In other words, the authorities don’t want residents to change anything to the disadvantage of those who are benefiting most from the status quo. Nonetheless, I want to use every possible means to stop nuclear power, and eventually we will have to fight in a national election. 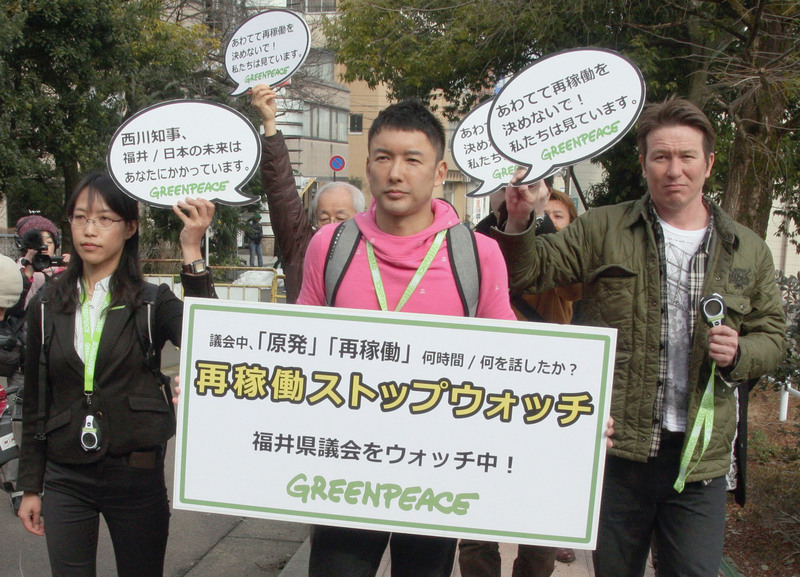 We have been campaigning for signatures on the streets in many parts of Tokyo and this movement is big. So even if the plebiscite were never held, the movement will have had a significant effect. To ask people to sign, we have to explain what the plebiscite is and appeal to them to support it. So does each campaigner have to study about renewable energy sources in order to promote them instead of nuclear power? Right. 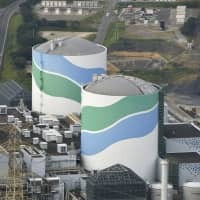 The government says that Japan should continue using nuclear power until the infrastructure of alternative energies are completed. They also say the nuclear plants can operate for several more years, so we should use them. Those ideas are nonsense. Instead, we — the campaigners — need to study such options as combining the power generation (using oil and coal) with generation using natural gas, which can also provide heat directly. And each of us has to explain this within 30-60 seconds to people on the street. You have a role in a stage play in April. Will you be able to combine that with your anti-nuke activity? It was a very difficult decision and I was wondering whether I should accept the offer — but in the end I did. However, I feel sorry that I will not be able to take part in the anti-nuclear movement during that period. The play is “Tsubaki-hime” (“The Lady of the Camelias,” based on a short novel by Alexander Dumas fils). The title role of a hauntingly beautiful woman is played by seventysomething Akihiro Miwa. Actually, Ms. Miwa was born as a man, but she is the actress for that role. I thought it was a rare chance to act with her. In the next 10 years, I will likely be offered far fewer acting jobs than before, so I really appreciate people offering me this kind of quality role. Also, if I am not acting much and just working on nuclear issues, then I think I will gradually attract less and less attention among the public. So I really do need to do acting work as well, so that I can stay in the public eye and continue drawing attention to nuclear issues. What would be your message on the nuclear issue to the world? Because we have a nuclear crisis ongoing in Japan, and because it appears to be a period of considerable seismic activity, we have no choice here but to become a country free of nuclear power. The problem is the speed of the shift. 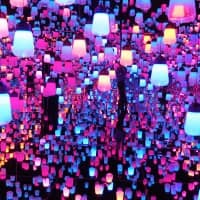 There are too many people who want to keep hanging on to the structure that benefits them enormously, and they are trying their utmost to delay the shift. I am sorry to say this, but it’s quite possible a similar disaster might happen again — and it could involve other parts of the world through contamination with radiation. It might be difficult to make Japan free of nuclear power through just the efforts of the Japanese people themselves. I apologize if a nuclear disaster here ever hurts anyone overseas — along with people in Japan. It is to avoid that happening that we are fighting. But I would like readers who are non-Japanese to think what you can do with us together. “Tsubaki-hime” will open in Tokyo on April 4 at Le Theatre Ginza and run until May 6. It then tours several cities nationwide. For more details, visit www.o-miwa.co.jp. 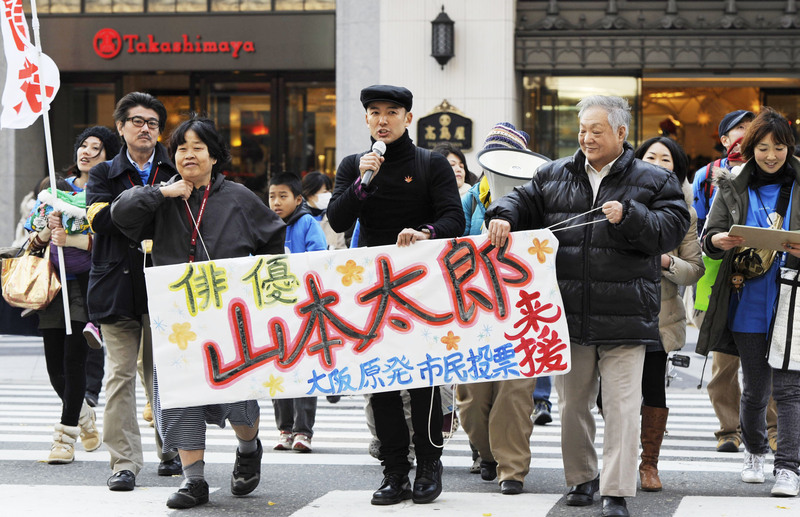 A rally organized by the Metropolitan Coalition Against Nukes will start at 2 p.m. on March 11 in Hibiya Park, Tokyo.